It was the first time Jansen had allowed back-to-back homers since 2013. Jedd Gyorko and Matt Carpenter just missed hitting home runs on Sunday. On Monday night, they didn’t miss. 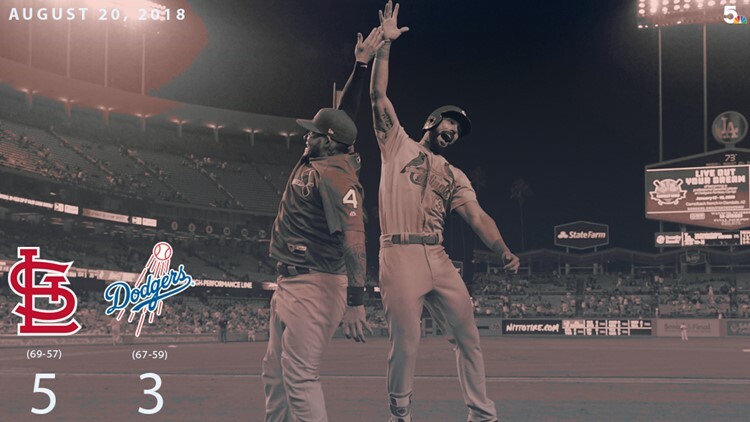 Gyorko and Carpenter’s back-to-back homers of Kenley Jansen in the ninth inning lifted the Cardinals over the Dodgers in the opener of a three-game series in Los Angeles. It was the first time Jansen had allowed back-to-back homers since 2013. The game took 4 hours, 10 minutes, the longest nine-inning game for the Cardinals since a 4 hour, 19 minute game on April 16, 2000 in Colorado. The win improved the Cardinals’ record in August to 15-4 and to 11-2 in their last 13 games. At the plate: The Dodgers had retired 12 Cardinals batters in a row before Gyorko hit his 11th homer of the year and Carpenter followed with his league-leading 34th … The Cardinals had left the bases loaded in the fifth, scoring once a walk … Their first run came on Jose Martinez’s 15th homer, in the first inning … The Cardinals have hit at least one homer in 13 consecutive games … Carpenter also had a single and double in five at-bats after getting just one hit, a bunt single, in his previous 20 at-bats coming into the game … Patrick Wisdom got the start at third base but Gyorko came in as part of a double switch in the seventh inning. On the mound: Austin Gomber got out of a bases-loaded, no out jam in the first inning and stranded six runners over four scoreless innings before giving up two runs in the fifth. That snapped his scoreless streak at 15 innings … The Dodgers tied the game in the seventh when Jordan Hicks relieved Dakota Hudson with two runners on base and allowed a single to Max Muncy on a pitch that registered 103 miles per hour … Brett Cecil recorded perhaps the biggest out of the game when he retired Cody Bellinger on a fly to center to end the eighth with the score tied at 3, stranding runners on second and third … Bud Norris walked the leadoff hitter in the ninth, but then struck out the next three hitters for his 25th save. Key stat: Combined the Cardinals walked 10 batters, only the third time they had done that in a game at Dodger Stadium. They also did it in games in 1984 and 1977, and also won the game when it happened 34 years ago. The five pitchers combined to throw 186 pitches in the game. Worth noting: Carlos Martinez and Yairo Munoz are expected be activated from the disabled list on Tuesday … Yadier Molina’s career-high streak of 27 consecutive starts was snapped as Francisco Pena started behind the plate for only the second time since the All-Star break. The other game was in the second half of a day-night doubleheader in Chicago. Molina is currently hitless in his last 17 at-bats … The Cardinals top pick in this year’s draft, Nolan Gorman, hit two homers for Peoria on Monday night increasing his season total to 15 in his first 50 games, split between Johnson City and Peoria … Joining the Chiefs on Monday was second baseman Nick Dunn, the fifth-round pick this year who had been playing at State College. Dunn is the fourth player in this year’s draft class on the Chiefs, joining Gorman, first baseman Luken Baker and outfielder Brandon Riley. Looking ahead: Daniel Poncedeleon will make his second career start in the second game of the series on Tuesday night. Poncedeleon pitched seven no-hit innings in his first career start on July 23 in Cincinnati.